Arbitration can be a tough thing to figure out, what with the Super Two status, service time, disabled list stuff, etc. That's why I'm not going to get into it for fear of ending the post with my head meeting the wall numerous times in a painful way. Instead, we'll take a look at who is eligible for arbitration, who has options that can be picked up or bought out and players that have elected free agency. Most of the players on the 2012 Seattle Mariners are still below the threshold of arbitration due to not having enough service time in the big leagues. They can negotiate a long term contract with the club, but if an agreement isn't reached, the Mariners can elect to renew the contract for the next season. Because of the new collective bargaining agreement, there are a lot of new rules that haven't been talked about much, such as the new Super Two status for players and Qualifying Players and the like. If you would like to read the CBA in it's entirety, you can find it here in .PDF form. Make sure you have Ibuprofen ready. Now, on to the Mariners players. To start, two players elected free agency shortly after the season ended. These were players that finished the season in the minors who had big league time under their belts, which is an awkward place to keep it. The players in question are Mike Wilson and Cesar Jimenez. Mike Wilson wasn't going to have a spot on the big league roster unless there was some sort of disaster that caused most of the Seattle outfielders to keel over or leave them unable to play baseball. He was a guy who had a little pop in his bat and not much else. He would've been insurance in the minors, but a 29 year old career minor leaguer with 28 plate appearances in his major league career isn't the best insurance. Seattle isn't exactly hurting for outfielders in any case. Good outfielders, yeah, they're hurting for that. Warm bodies that can stand in the outfield and watch as baseballs get flung in their general direction, not so much. Cesar Jimenez is another guy that won't be missed. He's had a few innings in the majors out of the bullpen, but he'll be 28 in November and really, relievers aren't something the Mariners are clamoring to hold on to. He was decent in his 34 1/3 innings in 2008, but with Charlie Furbush already in the bullpen, having a LOOGY in the pen isn't necessary. I'm sure he'll be able to latch on to another team at some point this winter since he throws with his left handed and as far as I know still has a heartbeat. Before we get into the arbitration eligible players, let me just say that when I say I think this player might make this much, I'm pulling it out of thin air. There's really no rhyme or reason to it other than what the player did this past season, what his salary was and how much of a bump I can see him getting. I could be way off on some of these numbers, and other I could be spot on. I'd appreciate it if you remembered the ones I was spot on and we can just forget the other ones. And if you're curious, if I have a player's salary from 2012, I'm getting them from the Baseball Reference site. Players eligible for arbitration for the first time in their respective careers are Josh Kinney and John Jaso. Kinney became a late inning guy late in the season in 2012 and was actually fairly effective in the role. I would imagine either Carter Capps or Stephen Pryor will be looked at for the role next season, but Kinney didn't make that much this past year. At least, not by baseball player standards anyway. By our standards, unless you're a CEO, then why are you reading this? If you are, donations can be made to......ah never mind. This being Kinney's first year of eligibility and entering his age 34 season, $6-700,000 would be about right. If the Mariners decide to hang on to him, it wouldn't hurt and it'd cost them practically nothing. I think he's back with the Mariners next year on a major league contract. Now we turn to John Jaso. Really, what else do I need to say that hasn't already been said? He's a 29 year old catcher who had a career year and isn't Miguel Olivo. Even being platooned with Olivo for the last half of the season, he doubled his career high in home runs for a season with 10, played adequate defense and was a decent hitter in a lineup of not so decent hitters. If you think it should be him over Olivo, you may need to get your head checked for recent trauma that wiped out your memory of the last two seasons. Jaso made $495k last year, and expecting a bump to somewhere around $1.2-1.5 million isn't asking much. Even if it was around $2 million, I think it'd be money well spent. Now we get to a player in his second year of eligibility, Shawn Kelley. Shawn Kelley was fairly effective for most of the year with a bump or two along the way. He didn't get a full year in with the Mariners, getting sent down to the minors to make room on the roster since he had an option year left. Even so, his strikeout to walk rate was an even 3 for the season with 45 strikeouts and 15 walks in 44 1/3 innings, with 6 of those walks being intentional. He was an effective reliever out of the pen and could be a good seventh inning guy to have in the pen as a bridge to one of the younger guys in the eighth. He's another guy I see coming back next year for a fairly cheap price. He made $600k last year and a salary of about $1 million would be my expectation. Now for year three arbitration players and the ones I'm just not sure about. Brendan Ryan and Jason Vargas are the two players in their last year of arbitration. Ryan is a player whose bat just isn't there any more. He may be passable in coming years, especially if he stays with Seattle and the fences coming in, but offensively he's not a guy to expect anything from. On the defensive side of things is another story entirely. His defense makes up for his lack of knowledge in swinging a piece of wood at a baseball and that might just be enough for one more year of watching Ryan play the field for the Seattle Mariners. Nobody in the system is ready yet to fill the role of shortstop. There may be a player they could call up to fill the void and he'd probably hit a little better than Ryan, but play much, much worse defense. It may seem counter intuitive to keep Ryan on a team that's been so bad offensively, but that's what I imagine happening. He made $1.75 million last year and I'm guessing there's something somewhere in the rules about a player having to get a bump in pay the next season out of arbitration, $2 million is where I think it'll end up. And now Vargas. Oh Vargas, what hast thou wrought? He's a guy who had major trouble being any kind of effective on the mound when not at Safeco. His safe haven was the green walls of Safeco Field before they decided to move the fences in. Can Vargas still be effective at home if they move the fences in next year? That's a question that will plague the fans and probably the Mariners personnel until Opening Day if he's with the club. I hate to say it, but I see him coming back next year. The pitchers Seattle has in the minors are scary good and if they develop, watch out. That being said, with the exception of Danny Hultzen, they're not ready. 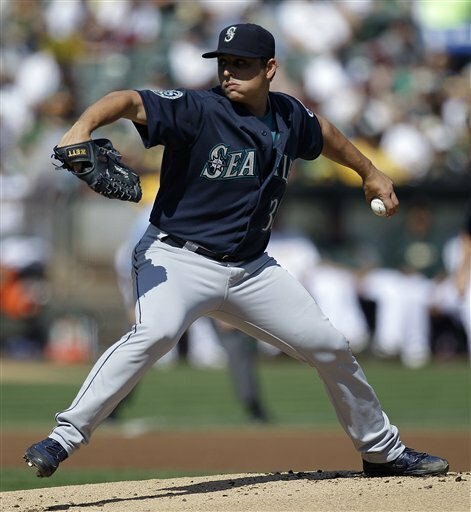 Even Hultzen may not be ready after the performance he had in Triple-A the last part of 2012. Seattle is going to need a starter or two to plug the whole until guys like Taijuan Walker and James Paxton are ready for the majors and Vargas may end up being one of those plugs. He made $4.85 million last year, but even after all of that being said, I don't think he's back next year. If I'm wrong, I'm guessing $6.5-7 million will keep him in the starting rotation next year. Again, I think Seattle will go after a guy like Kevin Millwood in the offseason. A veteran guy that doesn't cost much, can still be effective in the back of the rotation and keep the spot warm until one of the minor league guys is ready. Time will tell if I'm completely full of it or if I'm a magical wizard sent from the future to predict the future signings of Seattle Mariners players. Just a hint, don't bet on the magical wizard thing panning out. If you think I'm nuts with some of the projections or whether or not Seattle is going to hang on to a guy, leave a comment and talk about it. Debate always makes a person feel all warm and fuzzy inside.